I picked up Space Engineers from the Survive Humble Bundle probably a year ago now. I haven’t played a lot of the game. 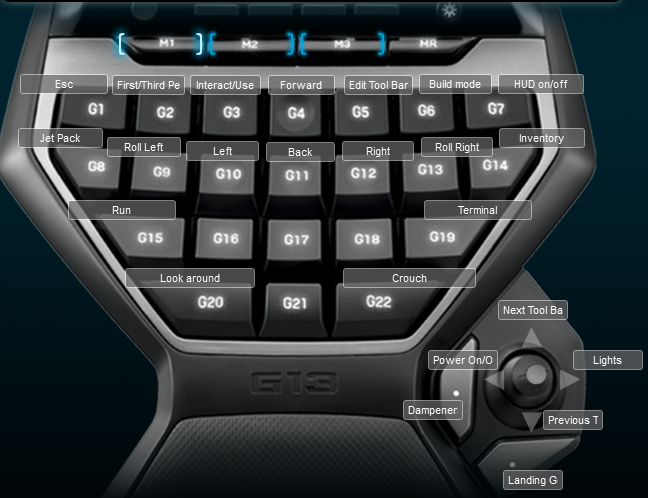 I made a Logitech G13 profile for it because that is what I do at this point unless the game works with my xbox 360 controller. I am not positive this is the layout I will stay with because I haven’t played it enough to know if I have the most common keys I would use in the right places. Mostly the current profile allows me to move around correctly and access the early game controls I needed. Below is the keyboard layout as it stands.